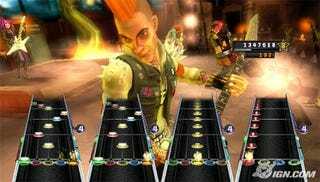 Vicarious Visions, developers of the Wii version of Guitar Hero, have some good news for Nintendo's long-suffering online gamers: Guitar Hero 5 won't be using Friend Codes. Nope! Not at all. Instead, it'll tap right into your Wii address book and share those contacts, cutting out a lot of frustrating data entry. Of course, that'll only work if you had people in your Wii address book in the first place, but hey, adding them there is probably worth it since this sets a precedent for other developers to follow.